Cooked rice with scrambled egg and peas. Cooked noodles with chicken breast pieces and vegetables in a shiitake mushroom and sesame sauce. Chicken breast pieces coated in wheat, maize and potato flour in a rice vinegar, pineapple and ginger sauce. Mixed vegetables with soya and ginger wrapped in filo pastry. Prawn tapioca crackers. Also, may contain peanuts and nuts. For allergens, including cereals containing gluten, see ingredients in bold. 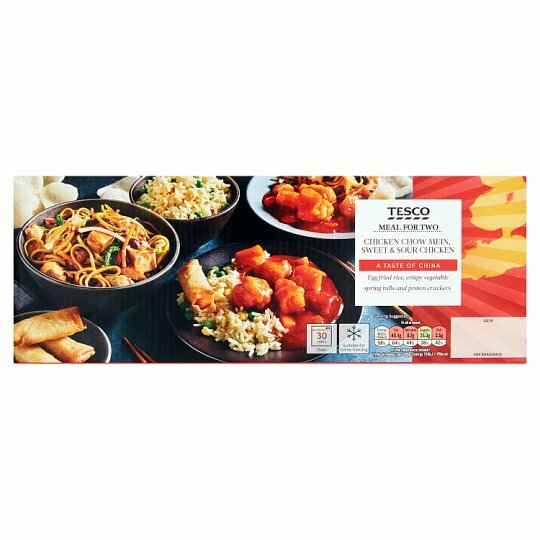 Instructions: 190°C/Fan 170°C/Gas 5 30 mins Pierce film lids several times on egg fried rice, chicken chow mein and sweet & sour chicken. Place chicken chow mein on a baking tray in the centre of a pre-heated oven for 5 minutes. Add egg fried rice and sweet & sour chicken to the baking tray and heat for another 10 minutes. Place the vegetable spring rolls on the baking tray and heat alongside other items for a further 15 minutes. Stir the egg fried rice, chicken chow mein and sweet & sour chicken before serving. Prawn crackers are ready to eat. Instructions: Each container must be heated separately. Pierce film lids several times. Stir the egg fried rice, chicken chow mein and sweet & sour chicken before serving. Prawn crackers are ready to eat. Oven heat the vegetable spring rolls. Not suitable for heating from frozen. Prawn crackers do not require heating. The containers may soften slightly but will regain strength on standing. Suitable for home freezing (except for prawn crackers). Ideally freeze as soon as possible after purchase but always by 'use by' date shown. Cooked rice with scrambled egg and peas. Cooked Rice, Peas, Pasteurised Egg (4%), Sesame Oil, Ginger, Garlic, Rapeseed Oil, Water, Sugar, White Pepper, Rice Vinegar, Lemon Juice, Soya Bean, Wheat, Salt. Cooked Rice contains: Water, Rice, Rapeseed Oil. Mixed vegetables with soya and ginger wrapped in filo pastry. Vegetables (50%), Wheat Flour, Palm Oil, Water, Rice Flour, Ginger, Sugar, Garlic, Soya Bean, Salt, Wheat, Plum, Sesame Oil, Fructose Syrup, Rice Wine Vinegar, White Pepper, Cornflour, Orange Peel, Sesame Seed, Japanese Pepper, Seaweed. Vegetables contain: Bean Sprouts, Cabbage, Carrot, Red Pepper, Spring Onion, Water Chestnut. Chicken breast pieces coated in wheat, maize and potato flour in a rice vinegar, pineapple and ginger sauce. Chicken Breast (29%), Sugar, Pineapple Juice from Concentrate, Rice Vinegar, Pineapple (6%), Water, Palm Oil, Green Pepper, Red Pepper, Onion, Carrot (3%), Cornflour, Ginger, Tomato Purée, Sesame Oil, Corn Starch, Wheat Flour, Rapeseed Oil, Maize Starch, Potato Starch, Spirit Vinegar, Salt, Colour (Paprika Extract), Cinnamon, Cayenne Pepper, Raising Agents (Disodium Diphosphate, Sodium Bicarbonate), Soya Bean, Wheat. Cooked noodles with chicken breast pieces and vegetables in a shiitake mushroom and sesame sauce. Cooked Noodles, Chicken Breast (26%), Bean Sprouts, Savoy Cabbage (4.5%), Shiitake Mushroom, Black Fungus (3.5%), Carrot, Water, Rice Wine, Onion, Rapeseed Oil, Sesame Oil, Sugar, Ginger, Cornflour, Garlic, Soya Bean, Caramelised Sugar Syrup, Salt, Flavouring, Molasses, Yeast Extract, Chicken Extract, Tomato Concentrate, Chilli Purée, Tomato Purée, Wheat, Rice Vinegar, Fermented Black Soya Bean, Mushroom Concentrate, Sunflower Oil, Extra Virgin Olive Oil, Spirit Vinegar, Spring Onion, Wheat Flour, Shiitake Mushroom Powder, Garlic Purée, Malted Barley, Garlic Powder, Garlic Concentrate, Lemon Peel Powder, Garlic Oil. Cooked Noodles contains: Water, Wheat Flour, Salt, Turmeric, Paprika. Wheat Flour contains: Wheat Flour, Calcium Carbonate, Iron, Niacin, Thiamin.